What an exciting day! it's the little things (ITLT) ventured Downtown to participate in the third annual celebration of arts and culture in Los Angeles, ArtsDay! 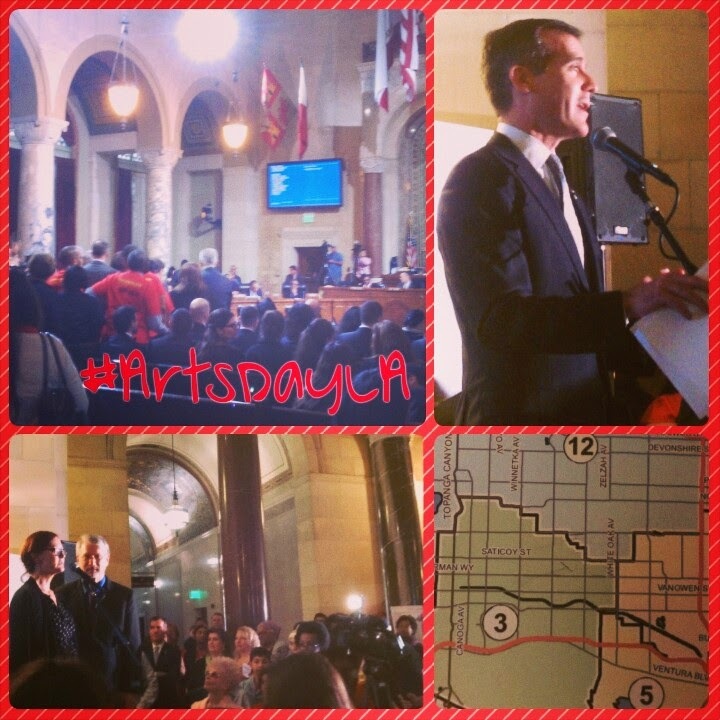 ArtsDay is one of the amazing events hosted by Arts for LA. Arts for LA is an incredible source of information for LA Artists (with a capital "A" -- to me, that means anyone who creates any type of art). They provide artist and organizational opportunities, jobs in the arts, arts in the news and community, and arts education. 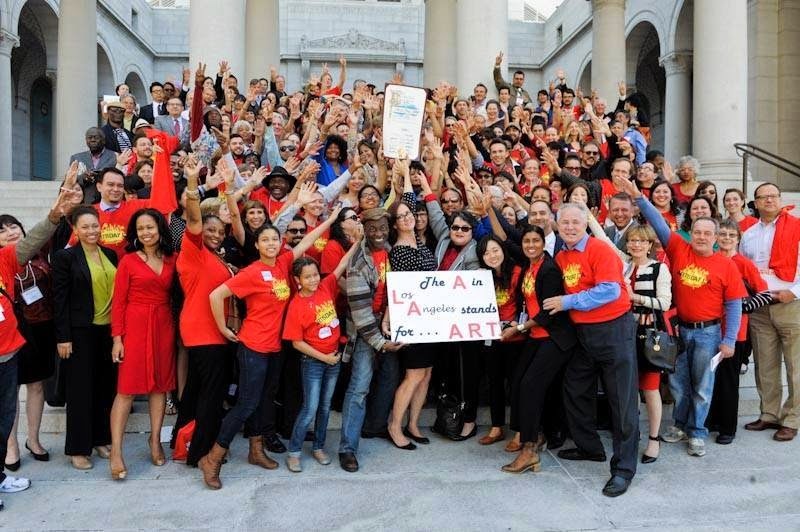 ArtsDay is an opportunity to unite the movers and shakers of LA Arts scene with the leaders who represent them in City Hall, "fostering stronger relationships between those crafting the vision of LA’s future and those who make it a reality." 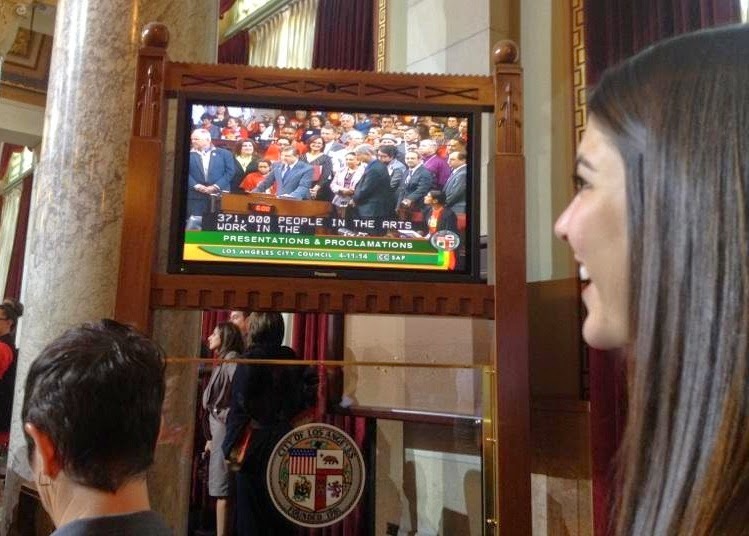 And on Friday, April 11th, 2014, we joined several other hundred people in celebrating. and a pin of ITLT on the map - District 3, represent! I knew I wanted to be involved in this huge, creative, amazing machine and ITLT fit in perfectly. At first I thought we might be an unorthodox organization to attend, but at our core we create artistic and powerful yet personal acts of kindness for our community in order to make a difference. Boom. Could we be more aligned? I get excited just TYPING about it. I digress. Anyway, we met an amazing amount of Artists, advocates, and supporters of the Arts, and we were honored to be in their company. Everyone we talked to fell in love with ITLT; my heart grew at all the positive responses. Over the next few weeks, I'll be following up with these organizations to see if there's anything we can do to collaborate and brainstorm for new and exciting ITLT projects. Just so excited for what the future may hold! The day was a success. We highlighted all the amazing things Artists have done and continue to do in our society, the importance of the organizations that mold our culture, and the need for support as these Creatives continue to create. Did you know that, according to the LA2050 Report, Los Angeles has the highest concentration of working artists and arts professionals in the nation. Also, the arts funnel $1.3 billion into the city in tax revenues (Otis Report on the Creative Economy). That's a lot of mula, so they need us as much as we need them. We thanked our elected officials for their investments in arts and culture and they pledged to continue to foster "healthy, vibrant, and prosperous communities" that allow the Arts to flourish. this was my favorite, especially such a great huge group of people there! 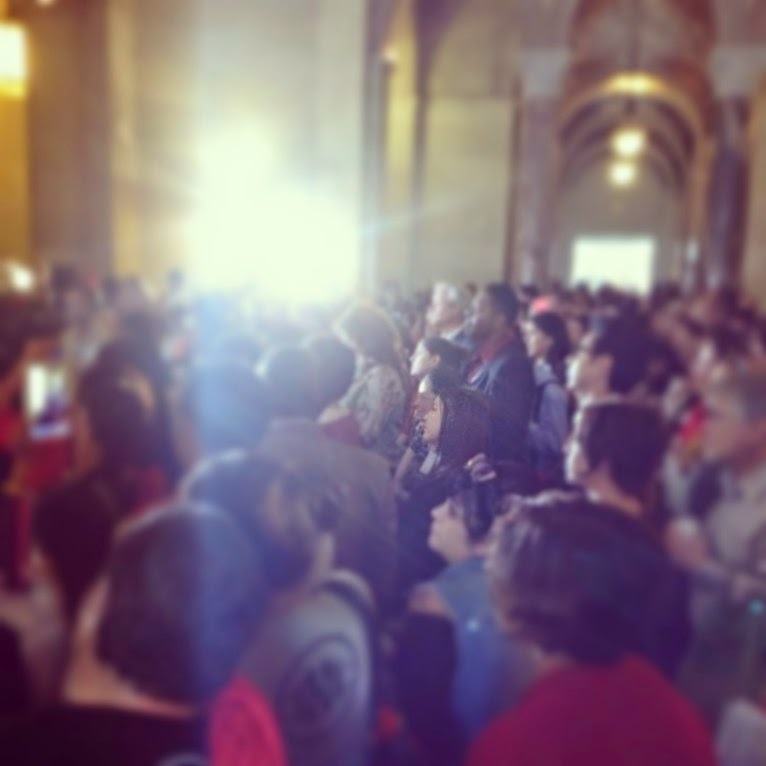 If you're not in LA, still check out the website to learn more about the National Arts and Arts Education budgets facing uphill battles in Congress. After spending hours of research on this project, I've concluded that there is no one way to make a difference in the world of literacy. I knew I was going to run into this problem eventually, I just didn't realize it would be so soon! Most of my projects start with addressing the issue at hand; figuring out a craft that will have a direct and positive effect on said problem. Since Niki approached me about collaborating between our two organizations (Poetry Solves Problems & ITLT -- check out the previous post for more info), the craft was an afterthought. A fun activity that accompanied our real efforts, but an afterthought nonetheless. 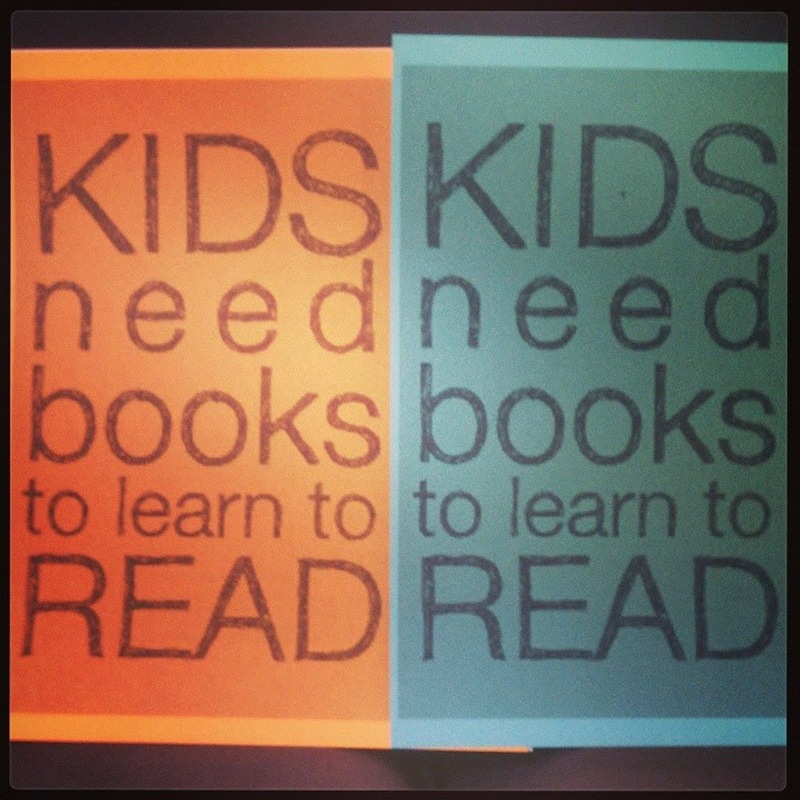 The reality of the situation is that kids need books. What I've tried to do here is outline a number of things you can do to make a difference. Which one works best for you? WE WILL LAMINATE AND DONATE! will do my best to accommodate! All you need to do is email me and save a stamp for a return envelope. Check out Little Free Libraries! It's basically the tiniest kind of library for your community. 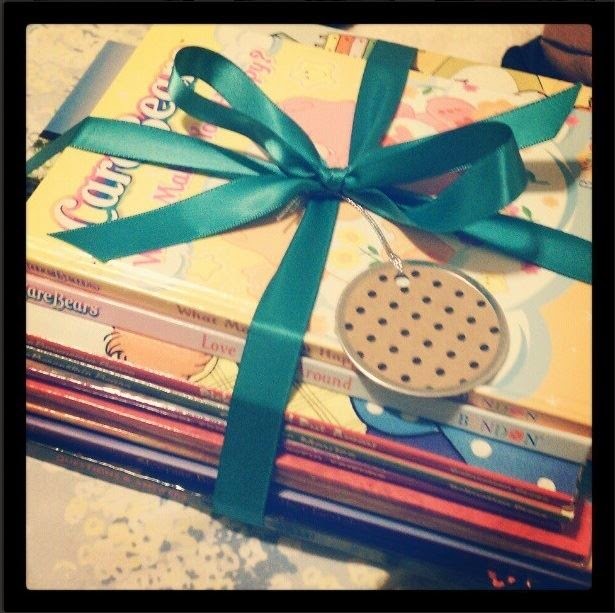 Build, order, or sponsor a book box and encourage people to "take a book, return a book." I love it because it's a little thing that can make such a big difference. If you are a teacher, I found this to be a fantastic list of 25 ways to support reading. There are several incredibly clever and fun ideas to promote independent reading, so be sure to check it out and incorporate at your school! And finally, if you don't have time to get hands on this round, Everyday Advocacy provides simple and effective ways for anyone to make a difference in their library community. They have step-by-step ways you can "be informed, engage, get inspired, share your story, and speak out." Take action! Leave a comment with the method that works best for you! Oxfam America earmarks donations to provide children in developing countries with much needed school books. It's funny how time wraps around in swirly twirly loops. This time it brought me back around to Niki. Niki and I met when we were about 9 or 10 years old doing musical theatre, and we bumped into each other again just last year with mutual friends in the LA music scene. She's found a calling committing poetry shenanigans in public places, bookbinding her own works, writing poems for strangers, and volunteering in classrooms as a visiting poet. (I stole that from the website. She's the poet, not me.) She also started a literary and art initiative called Poetry Solves Problems with her dear friend Crystal. The group is a celebration of sorts and this time, on their 6th PSP night, they opened their arms to it's the little things (ITLT). Niki had joined me for a Letters of Love craft night and wanted to find some way to collaborate as we are both, in titles, trying to solve problems by making a difference. ITLT focuses on anywhere/every day projects, but Niki asked if we could highlight a specific local organization. This was changing the game very early on in my own operation but I was excited for the challenge! The goal: to build awareness of literacy/illiteracy and emphasize the important of books and creative storytelling in young minds. Thus, the research began! 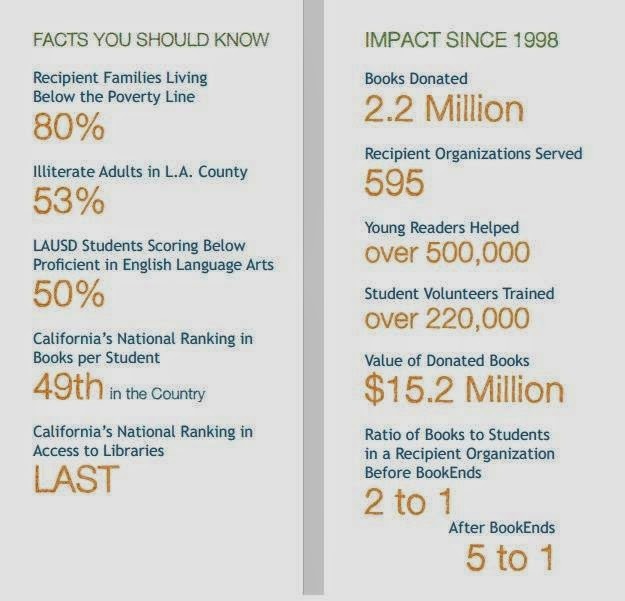 After much browsing and inquiring within, I decided that we would highlight BookEnds, a SoCal non-profit that recycles children's books donated from book drives and places them in schools and youth organizations in need of books. By providing access to books, BookEnds gives children the resources to develop literacy skills and to experience the joy and imagination of reading. Perfect, that's exactly what we wanted! Established in 1998 by an eight year-old boy, BookEnds has donated more than two million books to engage 500,000 students in the joy and imagination of reading. Incredible! Out of the blue, I called and happened to be speaking with Matt, the Director of Programs. 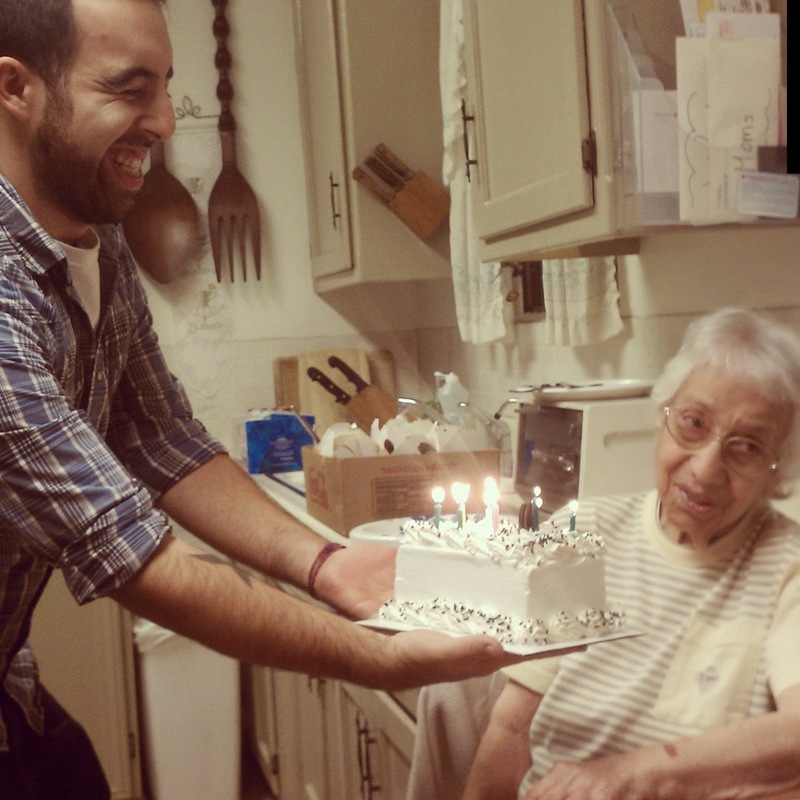 (Mind you, BookEnds is a small four-employee company, but they make such a difference!) 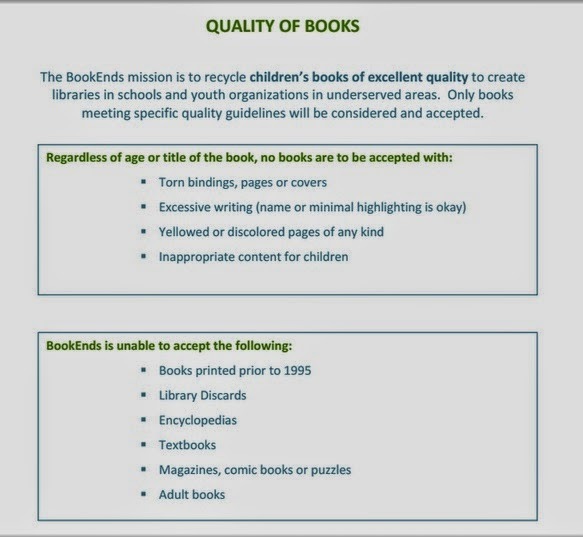 Matt emailed me a "Champion's Packet" which basically included guidelines for running a book drive, grade level book categories, the quality of acceptable books, and statistical facts. 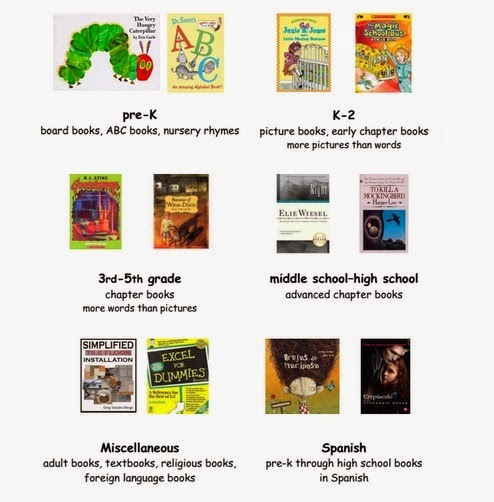 This information was wildly helpful in organizing our own book drive which we circulated via social media in the weeks leading up to the drive. 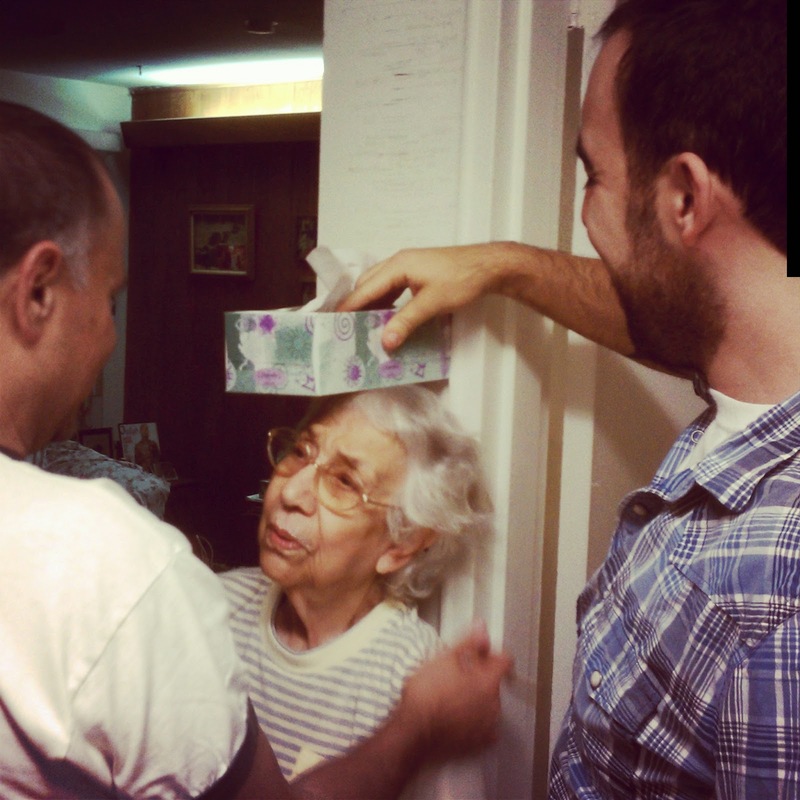 At the event, we ALSO offered a unique ITLT *creative acts of kindness* opportunity. Upstairs, above the open mic and poetry/musical features, I set up a craft table complete with stamps, stickers, glitter, washi tape, markers, and colored pencils for people to create BOOKMARKS! A little way for our contributors to personally (and literally) put their stamp on why reading is so important, a little encouragement for continuing what may be a difficult book to read, a little love to the stranger opening their new book for the first time. Inspiration hangs from twine by gold glitter clothespins (obviously). That night, the good people of PSP crafted 53 bookmarks and donated 36 books, totaling 50 books that we are now able to donate to BookEnds. (my personal 3rd grade favorite) A Wrinkle in Time! The full photo album can be viewed HERE and on the Gallery page, but take a look at the fun we had that night! Thank you so much to everyone who participated!! Making bookmarks is a GREAT way to supplement a book donation. Pre-made packets of bookmarks are sold at education supply stores (35 for less that $3) so this is an AWESOME activity to do with a classroom or a group. Find some inspiration quotes or whip up your own witty sayings, and get creative! Try to stick to flat materials (washi tape, stickers, glitter, etc) and avoid 3D ones (foam stickers, thick string, buttons, etc.) so the bookmarks can lie flat without indenting the books. Also, it might be a good idea to laminate your bookmark so keep it in tip-top shape! it's the little things will mail YOU a*FREE* BOOKMARK! and WE WILL DONATE IT! Email us with your full name and mailing address.